Bob Millard sent two sets of memories, this one describing the Blitz Weekend and an earlier one "The Bath Resistance Movement" which described his recruitment and training as a member of the Auxiliary Units. New readers might find it helpful to read that first, which will give a better context for what follows. The blue additions below are mine. In 1942 I was living in [Number 17] Rockliffe Avenue, Bathwick and therefore did not suffer the severe trauma that affected other areas of the city but I hope that my recollections of that weekend may prove to be of some interest. Saturday dawned fine and at midday I joined the members of the Home Guard rugby team to travel by coach to play the formidable R.A.F. Yates bury team; we lost. That evening I went to the Castle in Forester Avenue to play solo for a half-penny a point in the serious solo school that regularly met there. On returning home I sat talking with my mother and brother, my father was away in the Navy, and as we were preparing to go to bed the sirens went. At first we took little notice but when it became obvious that this was a serious alert we went to the cellar after inviting our neighbours, Mr. and Mrs.Randall [from Number 19] to join us as our cellar had been deepened and reinforced with timbers by my grandfather. The noise of the bombs was distant but suddenly there was the whistle of falling bombs and explosions in the vicinity of the house which blew in the cellar door and made my ears pop. Subsequently we learnt that this was a stick that fell in the Kensington Meadows to the rear of Kensington Place. Around 0115 a.m. the all clear sounded so, belatedly, we retired to bed only to be sent to the cellar again by the second attack though this time nothing fell near us. Sunday morning, despite the disturbed night, we were up early to see what damage might have been caused besides that to the cellar. Daylight revealed that this was minor, the dining room window frame had been blown inward, tiles on the roof of both houses had been dislodged and there was shrapnel damage to the rear wall and chimneystack. Fortunately the tiles were retained by the guttering and not broken so Mr.Randall and I were able to make a temporary repair by working from inside the loft to hook the tiles back onto the laths; the window frame was able to be driven back to make it weather proof. As shown elsewhere on this site [there is a link at the top of this page] I was a member of the Auxiliary Units and later that morning I received a call from the patrol sergeant saying that he was picking me up as there was a job to do at our bomb store. A bomb had fallen close to the old Claverton quarry badly damaging the stone hut that we were using to store explosives and munitions. On arriving there we met two men that I didn't know and we loaded our stores into their van and drove to Manor Farm, Swainswick, to unload them. As we were doing this Captain Shackell, our area officer and who owned the farm, noticed that one of the cases of sticky bombs [officially the S.T. Grenade or the Type 74 Grenade, pictured] had what appeared to be an oily substance on its side, which he considered might be nitro-glycerine leaking from a damaged bomb. As nitro-glycerine is not a substance to be treated lightly the case was gingerly carried across the fields to a ditch where, in today's terrorist terms, a controlled explosion was carried out with a satisfying bang. On returning home I learnt from the local A.R.P. warden that volunteer parties were being formed to help the rescue services so I went into town and joined a group of about half a dozen Home Guard and, under the supervision of a member of the rescue services. 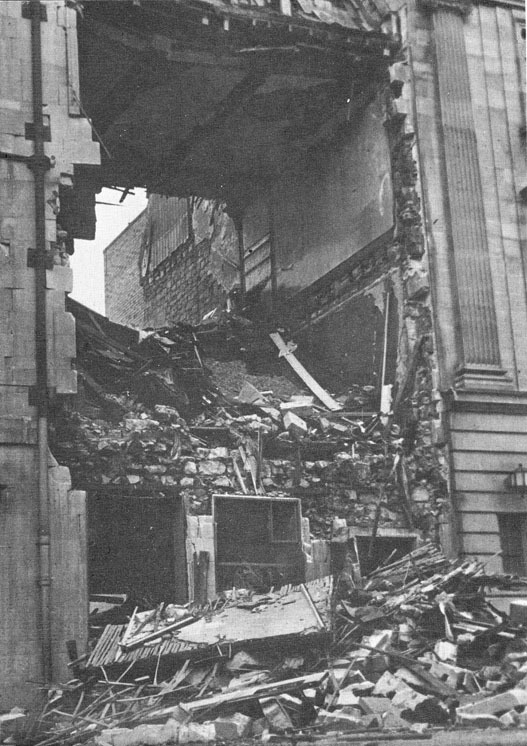 we were directed to search the bombed Smith's Wine Vaults in Westgate Buildings [pictured right] as it was believed that the landlord and his wife might be buried in the rubble. It was hot, dusty work but in the end all turned out well as after abut three hours we were informed that the missing couple had been located. The event had its lighter side too for as we worked our way towards the cellar several unbroken bottles were found and "liberated". On leaving the site we were directed to the Royal Bath where the showers were still working to get cleaned up. I remember that the main bath was empty and being told that the water had been used to fight fires. After a meal I left home about ten o'clock to meet other members of our patrol at our operational base in the quarries on Hampton Rocks as we had previously arranged to meet to check equipment and generally tidy up. Being underground we were not aware that the third attack had started and on surfacing and walking back to the top of Bathwick Hill were surprised to see aircraft and explosions. As we came to the point where the bridle path from the Downs joins the North Road there was a group of soldiers with a Lewis Gun on antiaircraft mounting. As we approached a sergeant called to us, "Bloody gun, ten minutes ago a Jerry came across very low and the ******* thing jammed"
Monday morning it was back to work as usual. 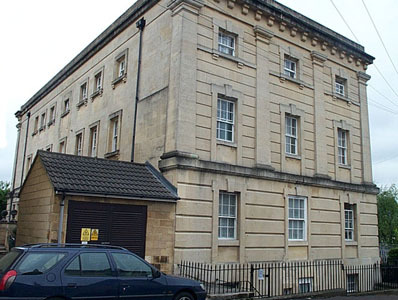 As a trainee craft teacher I was due at the Old Gaol Twerton [pictured left - this is a modern picture but it looked very similar in 1942], used by the Technical College as the centre for the Building Department, for a practical session in the workshops. When I arrived Mr.Hardy, Head of the Building department, was organising a group of wood machinist apprentices to make a number of ladders. Clear plastic sheeting was collected in rolls from the Civil Defence and groups of us went into the surrounding area to assist householders with broken windows. This was the main activity for the next few days. On Monday there were rumours of looting and the Home Guard were requested to supply supporting patrols to assist the police. Although not Home Guard I and another member of our Auxiliary Unit patrol reported to the Home Guard headquarters and were allocated an area to patrol. I am pleased to say that we found nothing to support the rumours. Two members of our patrol suffered serious losses that weekend. 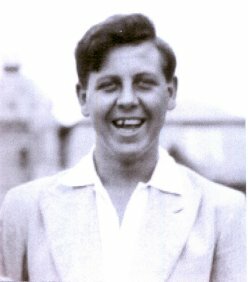 Gordon James' father, Clifford, was killed in Oldfield Park while on duty as a Special Constable [he was killed in the Police Post by the Scala Cinema in the second raid] and Mike Jones was bombed out of 9, Hayes Place [There is a picture of Hayes Place in the photograph section: Number 9 is the house just past the ruined shops].